Reality TV star Snooki slammed after the rumors following the marital issues with her husband Jionni LaValle. Most of our generation might be obsessed with bragging about their relationships on social media, but when it comes to Snooki, she is definitely not. The American TV personality, Snooki, who rose to popularity from MTV's reality TV show; Jersey Shore shuts down rumors of going through marital issues with her husband Jionni LaValle. The 31-year-old star recently stated, not posting your partner's pictures on social media doesn't mean that you and your partner are going through relationship issues. 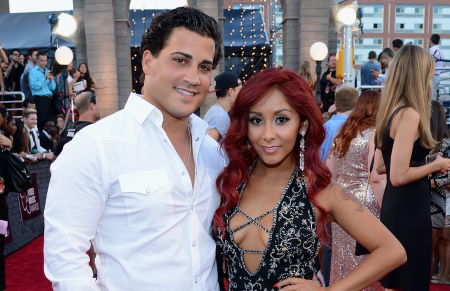 As per Snooki's statements to US Weekly, both her husband Jionni and Snooki herself are doing perfectly fine. "I feel like if I don’t post pictures of Jionni or he doesn’t post pictures with me, it’s like we have marital issues and it’s not even the case." She further revealed her partner Jionni doesn't want much attention nor any spotlight. "Babe, when you marry me, sometimes we got to take pictures together. He’s like, ‘Nah, I’m good." "I feel like, when people don’t see us together in pictures, it’s like, ‘OK, something must be wrong." Her husband himself revealed his lack of fondness to appearing on TV last year in January. "Being a reality was never something I wanted to be when I grow up." In addition, Polizzi, who is expecting her third child later this year addresses although the two don’t post their life on social media, she still loves him to death. "and he’s my best friend and he’s just a little shy so leave him alone." Thanks, Snooki on teaching a lesson to these people that not posting your partner pictures on social media doesn't mean any relationship issue. This delightful pair met in 2010 on the set of Jersey Shore season 3.